A couple months ago Rotor Riot started promoting the 'butter kwad,' a six inch alien with two blade props. 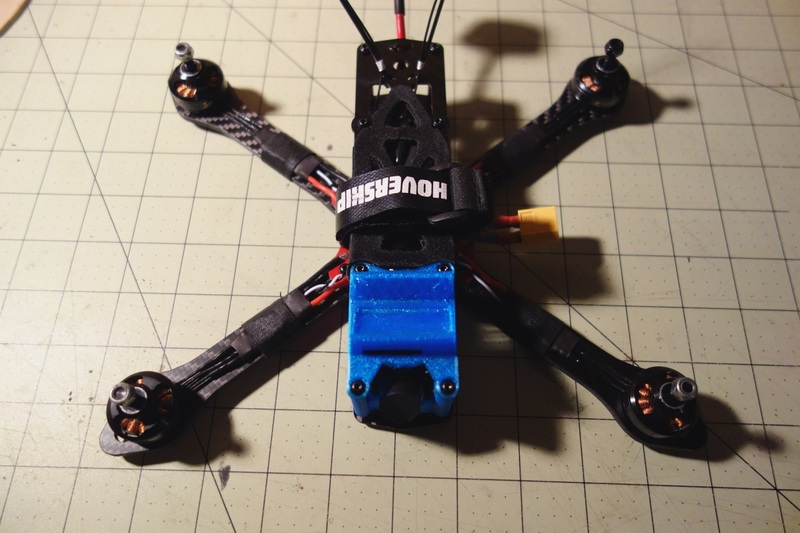 Well I don't know if butter kwads took off beyond the couple of rotor riot videos, but I had been thinking about going back to six inch props. After building my 220 martian, my ZMR250 that I flew on 3s sat in the corner. 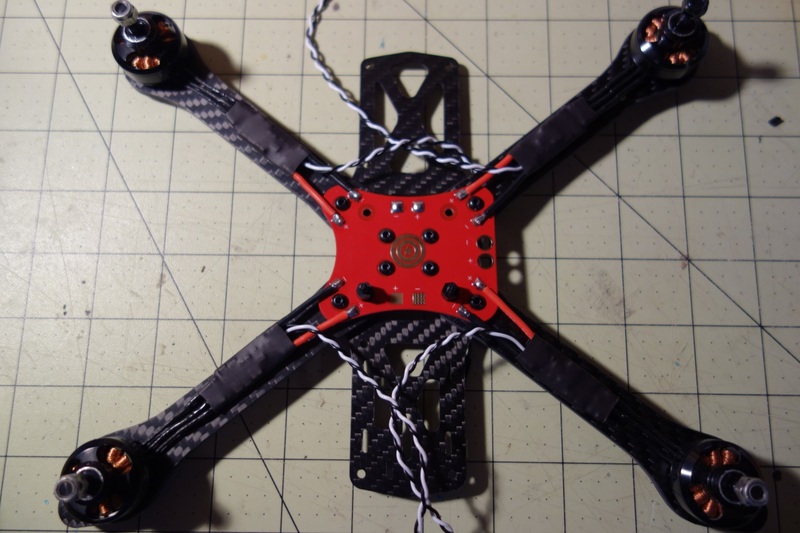 I wanted to keep flying it, but the old escs without damped light and the naze32 were going out of style. Then I saw the butter kwad and thought about upgrading the ZMR250 to 4s. 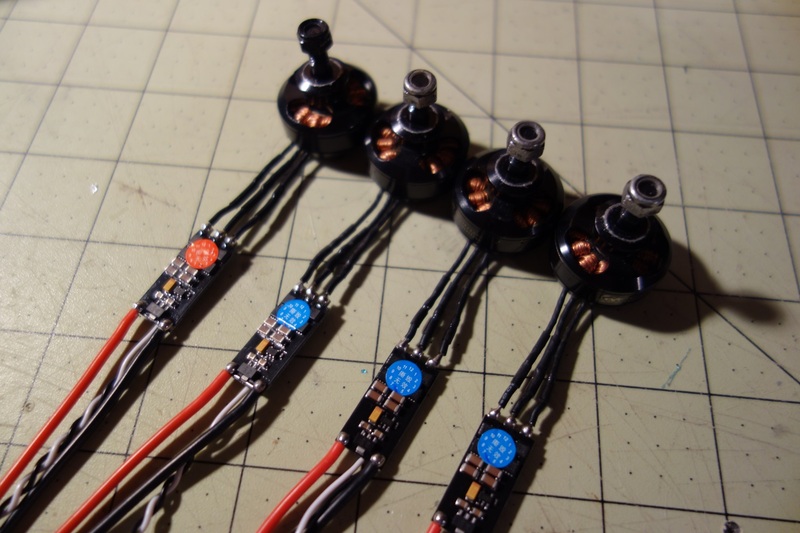 With that idea came the need for new ESCs that could handle the current. I got a great deal on ESCs during one of ReadyMadeRCs flat spin sales so I also treated myself to a new flight controller. Spoiler: I did this build over Thanksgiving so most of the build process is past events and I have already maidened and flown this build multiple times! 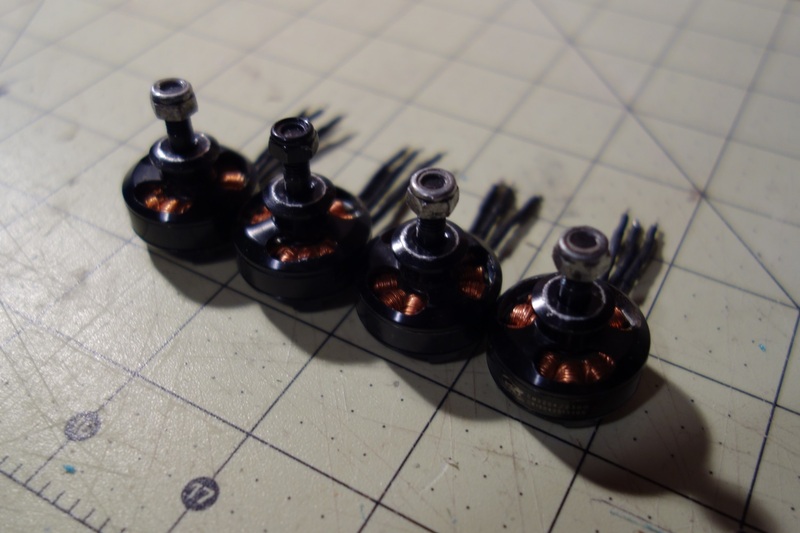 The motors are cobra 2204(5)-2300kv motors that were on my ZMR250. These motors were the bees knees back in the day, but now people might not even recognize them. 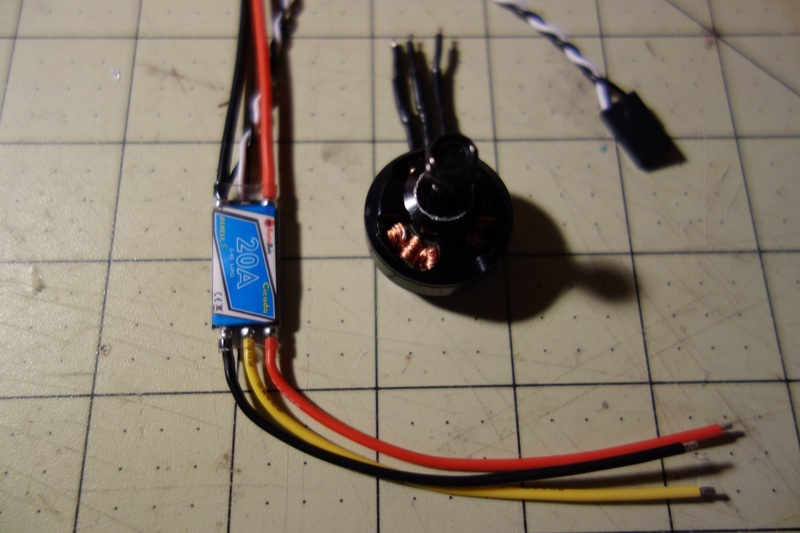 I desoldered the motors from the original rotorgeeks 12a escs and evened out the length of the motor leads. 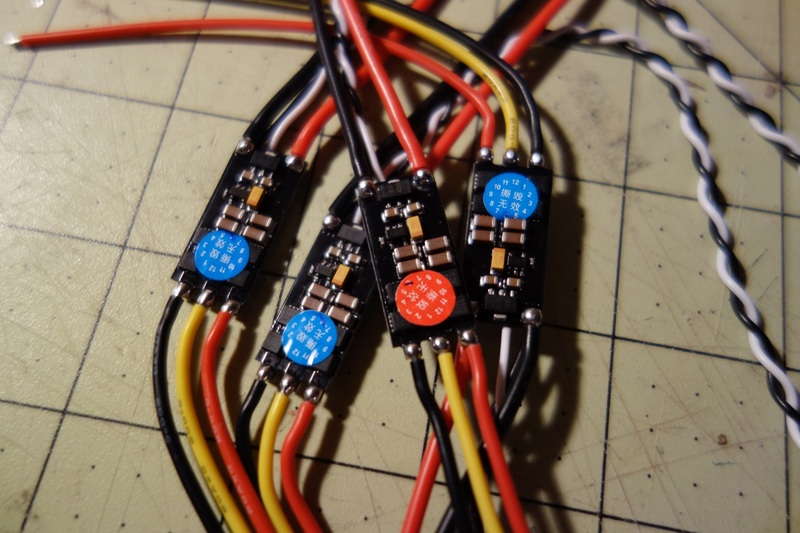 The new ESCs are Sunrise Cicada 20a BB1. There are newer BB2 versions of this ESC which is why I was able to get them on sale at RMRC for so cheap. Apparently the BB1s can not run DShot, but I have read that they can actually handle up to DShot 300 which is ok with me. These ESCs are tiny! Compared to my KISS 24a they are about half the width. Taking the heat shrink off shows just how small and simple looking ESCs are these days. Soldering the motors to the ESCs was easy enough given the pads on the end. 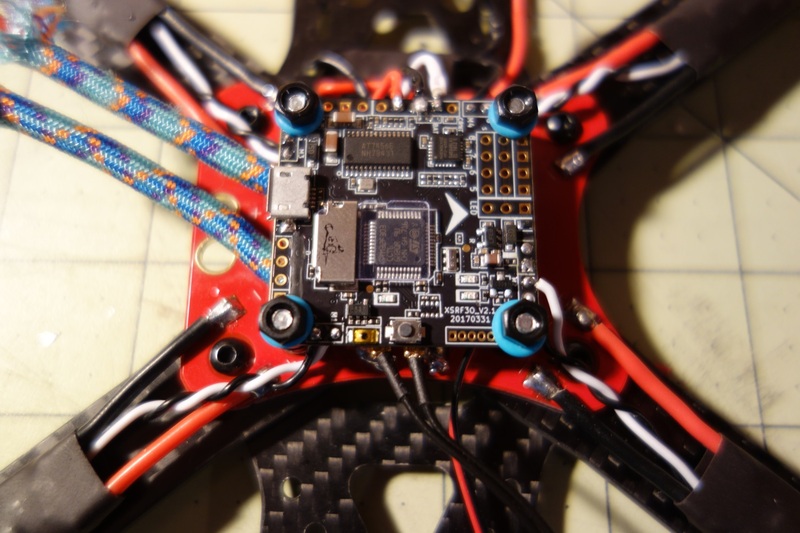 As always, having a PDB in a build makes the ESC installation a piece of cake. Skipping a couple steps ahead, the flight controller is installed. I think the flight controller is pretty great. 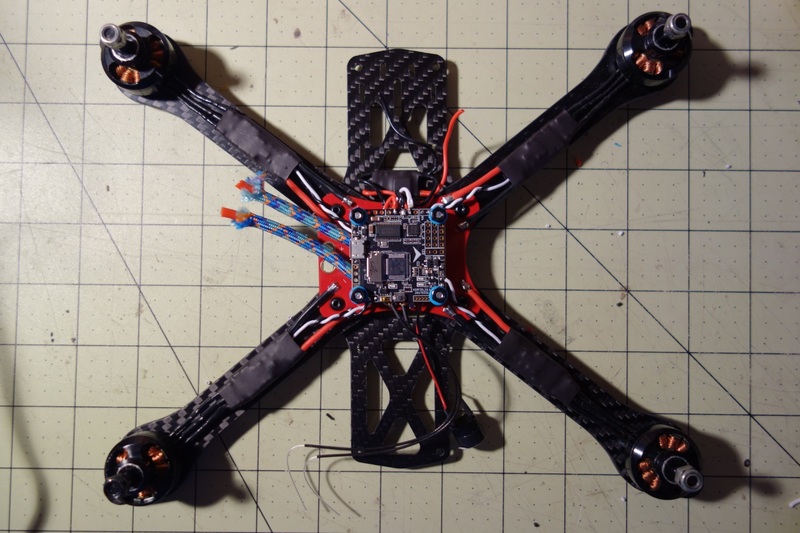 It is a Frsky XSRF3O, an F3 flight controller with an XSR receiver built in. It also has a built in OSD and blackbox logger. All in the same size as my old Naze32! Here is a close up of the flight controller. I had to rotate is 90 degrees so that the receiver antennae point toward the rear and so the blackbox is easier to access. Not pictured here, but the flight controller is mounted on rubber dampener standoffs in addition to o-rings. This should really help the vibration dampening on the flight controller and improve performance. All together with the vTx and camera. I printed one of my martian camera tilts in TPU. 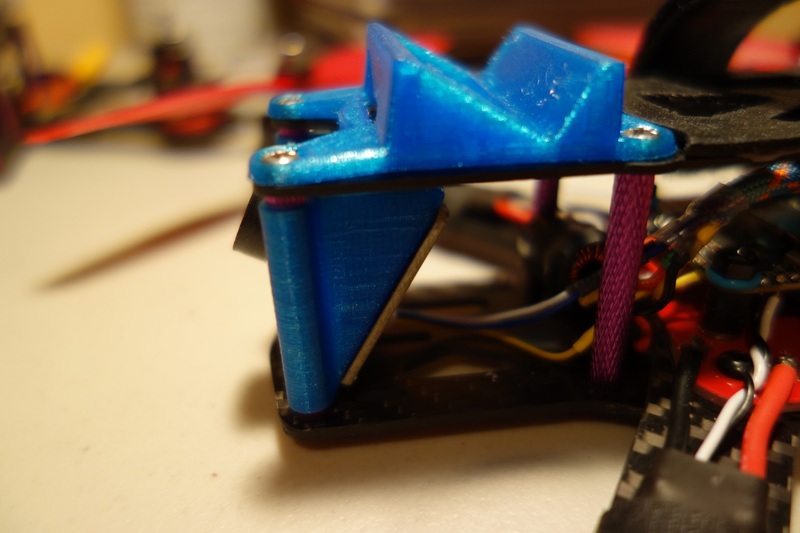 I also made a custom camera mount for the FPV camera out of TPU because the eachine camera is too wide for the stock martian fpv cam mount. It has a 30 degree angle and technically means I'm 'soft mounting' my fpv camera which apparently is the cool thing to do these days. The XSR antennae come out the top plate and are supported by zip ties. I was not a huge fan of this look, and I was about to find out the faults of this placement the hard way. For an FPV antenna I just used a classic Aomway cloverleaf in a 3D printed case. So I maidened this build a couple weeks ago. It had been a while since flying and working with betaflight, but luckily it wasn't too hard to pick up again. That said, there are so many new features! Anti-gravity mode, turtle mode, adaptive filtering, etc. And now with this flight controller I get to play around with the betaflight osd. I got everything setup using stock PIDs and the rates I like. I also setup the ESCs with DShot300, even though RMRC claims they can't do Dshot. Maiden flight an wow this build flies well out of the gate. Stock PIDs and my rolls and flips felt as if I'd been tuning for a few batteries. Betalfight has really improved since I last used it. 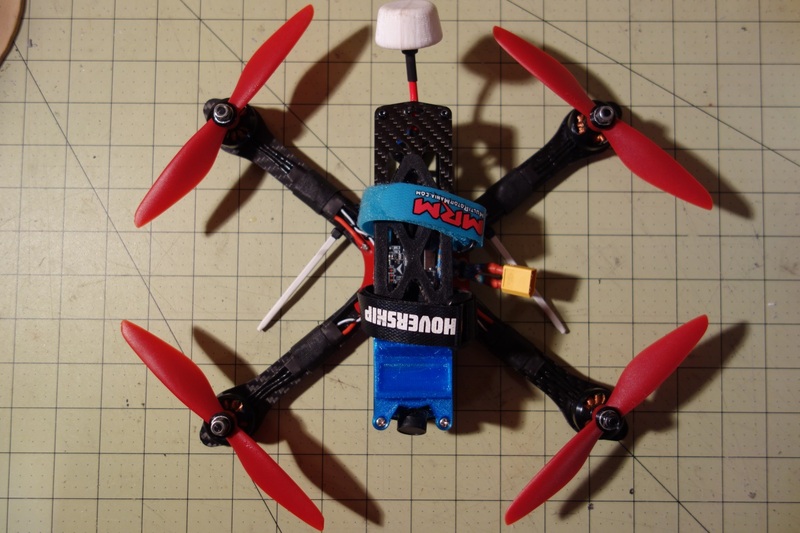 It probably makes a difference to have dshot, and a vibration damped F3 flight controller. And yes these ESCs do work with Dshot300. 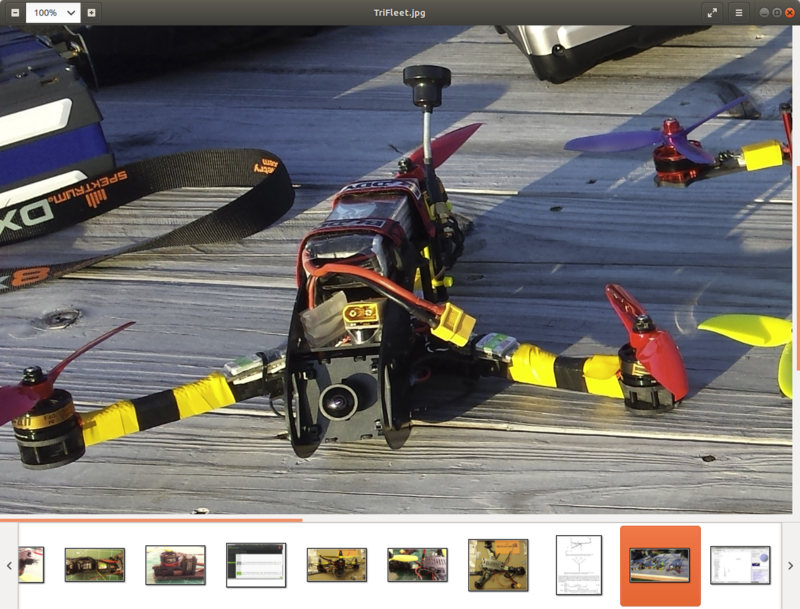 The eachine camera is not actually that bad, but the transition between light and dark is a little slow. My first day flying it and I had one rough crash. Unfortunately in that crash a prop severed one of the two XSR antennae, but I could still fly with the remaining one. 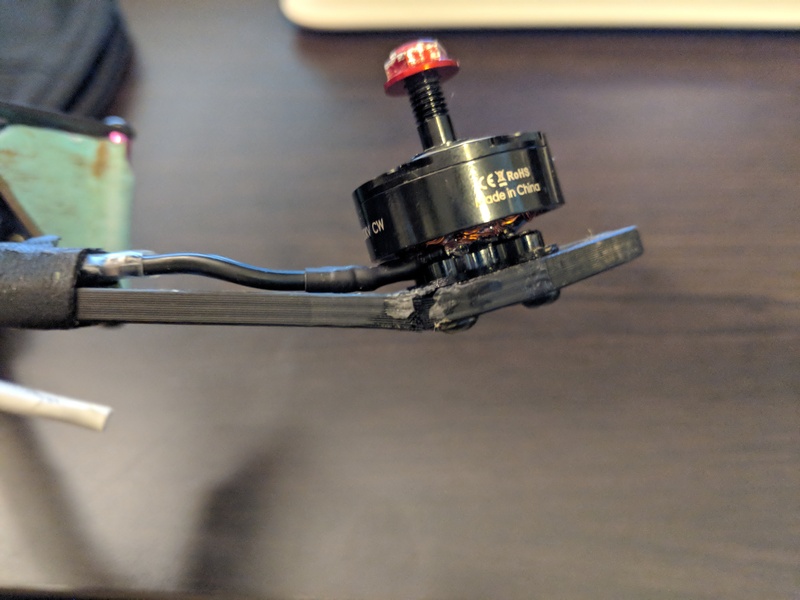 Turns out mounting the antennae above the props and on flexible zip ties means the antennae can be sucked into a spinning prop during a crash. So I relocated the XSR antennae to below the props. I used a technique that one of the club members at school uses, and that I think he got from our own Joshua Bardwell. Zip ties on the arms support the antennae and hold them 90 degrees apart. Looks a little strange, but I can get used to it. Things were flying great, but I knew I could get better. Something new to me is PID tuning on the Taranis using LUA scripts. After a headache of updating OpenTX and installing the LUA scripts, I was able to get it working. This made tuning so much quicker than the old method of plugging into a computer every time. A couple tweaks on the PIDs and things got even smoother. It really does feel more 'floaty' than a 5 inch build, and 6 inch two blades make a very distinct sound. Nice looking build Since I started using that method to mount the Rx antennae I have yet to chop one up, it's definitely the way to go. It's been a while, but temps and snow conditions were finally good enough 'recently' (this was two weeks ago) to get out and fly. I hadn't flown my minis since I tuned them up back in early December. I have been on the sim pretty frequently though so I wanted to see how my skills transfer over. I did not have my HD cam mounted so DVR footage will have to suffice. Noticeably I was testing out how the yaw felt as that has been my focus as of late. Also I have to change the settings on the low voltage warning because it pops up in every throttle punch! So far I am really liking the feel of this 'butter kwad.' It is fast and makes a noticeably deeper beat in the air that will impress your friends. It feels quite a bit looser than my KISS setup (still locked in, but as if the kiss has more expo), but its almost as if that supports me doing more aerobatics. Only downside of this quad so far is that the props tend to break far more often. Had a crash into a ghost branch today and lost all four of my props, just like the old days (cough HQ). Worth noting that the DAL 6x4.5 props I am using are like 3 years old and it is cold out, so maybe more modern models will be better. The Versa copter was the OG "Butterquad" Remember when Skitzo and Freybot built and flew theirs in that one episode. that was the first time I heard the term "Butter" used in relation to a quad. Its always been "Locked" as the buzz word for free style quads. Last year I went thru and started getting back to 6 inch 2 blade on 4s with my Versa. I re tuned it and it does fly smooth as silk LOS. 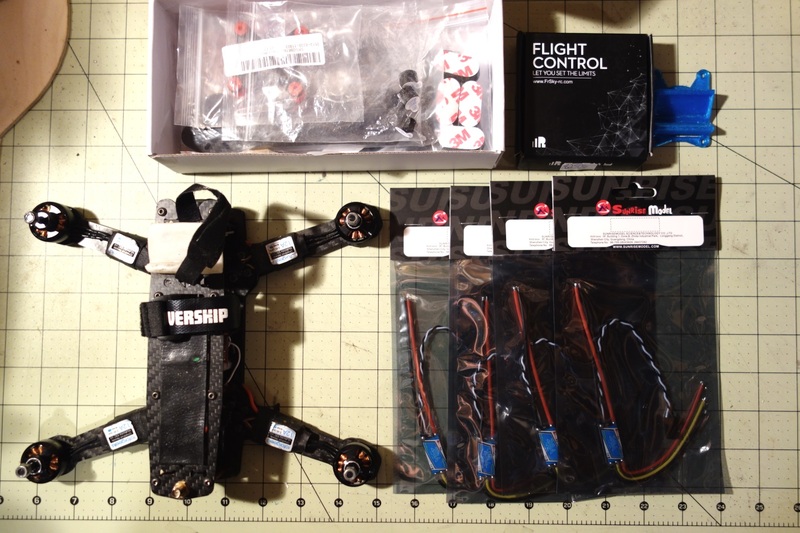 I have not had extra cash to get a designated FPV set up for it yet as I transitioned into building TAZ. I expect to get back to it though over the course of this flying season as the versa does make a serious cruiser / butterquad and is really fun to fly. Will be interesting to see what it can actually do now that I have some skills to toss it around with as well as wayyy better tuning knowledge. Newer Dal props are awesome. I stopped using the Gemfans early in my Versa days as you look at those props and they shatter. Its even worse as the colder weather we deal with sets in. Got a pretty good tune on the new HQ durables 6x4.5 props this past weekend. There are still some oscillations in heavy prop wash that I am having a hard time getting rid of, but overall things are flying great. These props really are durable too! Today the weather was great/freaky (70F in February! ), and the club here at school decided to do some race laps. It was the first time I have flown a race track with gates other than in the sim. I think I did pretty good, but I want to go faster! Watch the video if you are interested. There are some powerloops in there and some basic freestyle at the end if you crave that. Not too shabby for a first run with real gates. No crashes AND you was doing that double as a power loop gate too! the sound is weird.. Not sure if you have a mic set low or its just electrical noise but that Waaahhhh wahhhhhh wahhhh sounds pretty cool like you can hear the lower kv just pushin the air with a purpose. Thanks Psyborg. Yea thats not noise from a mic. It is electrical noise feeding into the video feed. Pretty cool that you can still hear what the motors are doing through that way. So I am still having some trouble with random rx loss for have a second every now and then. It is all at the same location so I am hoping it is interference with the nearby radio tower or something. Today I pulled off my first Matty flips in real life. It was pretty exhilarating and not as complicated as I thought. I would like to try it around a closed arch or something. I've also been dialing in the tune on this build and it is feeling pretty good. Prop wash is very close to disappearing. 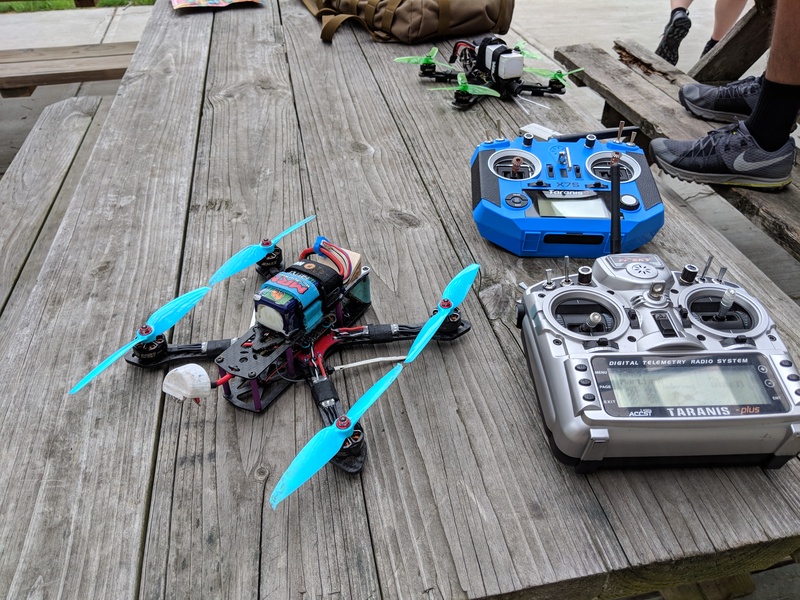 I've flown dozens of packs through this quad and my 5" kiss quad in the past couple weeks, and I haven't enjoyed flying this much in a long time. On the butterkwad I have been flying with Gemfan Flash 6042 props. I haven't flown Gemfan since the cheap abs HQ substitutes back in the day, but these Flash props were surprising. I have a friend in our club who tried these props and got some annoying oscillations. Could have just been his PIDs though (I'm the only guy in the club who tunes his PIDs). My experience has been quite the opposite. I was flying HQ durables 6045 props previously and would get some pretty bad shakes at higher throttle. Additionally bolts would fly off in flight due to the vibrations (thats another topics). With these Flash props and a quick tune the flying is way smoother. There is still some jello in the cam, but I dont think its PID related. There are still enough vibrations to shake bolts off (queue in locktite), but overall there are the best 6" props I have used. After looking at them straight on I have trouble believing they are 6042, more like 6056 or something; they have a pitch like racekraft props. And the flying reflects that too. I can hover at 20% or less throttle and punch across a field in no time. The batteries are not fans of this and the recent heat however, and get pretty toasty each flight. They are also just as, if not more, durable than the HQ durables props. Now for the bad news; this frame might be done. I cracked both of the right arms at the CDRA nationals, but they were still stiff enough to fly. Today I crashed into a tree and fell 50ft into the grass. The front right arm is now totally cracked. I'm debating CAing the arm back together so I can fly while I wait for more arms from Banggood, or I will buy an Armattan Chameleon and move my stuff over there. I've played a small bit with those same Gemfan Flash 6042 props on my mini tri. I had HORRIBLE jello in my FPV feed, and I've never had that with any other props. I also had a tail pivot bolt back out, so that may have aggravated the problem. Or was it caused by the vibes.... Hard to say for sure. I'm putting a longer pivot bolt in that will reach the "Ny" in the Nylock nut to keep it from falling out again and will see how they do with the pivot mounted better. Straight pitch blades are a bear to tune. they can be tuned well for a "range" of throttle but can never get them good thru out the entire range. I stopped having that issue when I switched to the Cyclones and Avan style blades with the high pitch near the hub and a gradual decline to the tip. Far easier to tune with and even more steady performance across the entire throttle range. This is todays flight with Taz with slightly gusty winds on 4s with Dal Cycleone 5050 bi blades. Nice performance across the full range of throttle even with the winds. The 6042 flash props still give enough vibrations to shake bolts loose, but they are good enough that the PID controller doesn't get oscillations at higher throttle because of them. That was the issue with the HQ durables biblades. I've been told from an aeronautical engineer friend that biblades are inherently more prone to vibrations because there are points in the rotation where the entire blade is parallel to the flow and no lift is generated. Whereas tridblades or greater always have part of the blade working with the flow to create lift / a more constant drag force throughout rotation. Litterbug if you have any other suggestions for 6" biblades I am always open to try new ones. Psyborg nice video. Each time I check back you are getting faster. I wish there was more development for props in the 6" plus range. Right now the best options for biblades are the gemfan flash, and for triblades there are gatebreakers, racekraft, and cyclones. I'm trying to avoid triblades because I like the uniqueness of biblades, and I don't want to destroy my batteries any more. If I start getting untameable jello once I start mounting my HD cam I may change my mind. Thanks mate. I can and do fly faster. I just don't do it on a daily basis as I don't have the money to chew thru batteries and arms so I work on raising my average speed. What I post is the minimum I fly regularly and reliably. You should really get away from Gemfan and probably the HQ as well imo. The Gemfans break if you look at them cross eyed and the HQ will spin flat. With today's motor tech and the power they put out run up speed is far less important then it used to be. The new style blades are where the tech is going as its great low end punch as well as superior high rpm stability. Taz is breaking the 100 mph mark between 50 and 60 m from a dead stop launch off the ground on 4s without a stutter. I can also run wide open across the field and do a 180 dead stop, then blast full throttle again and only occasionally get some shake from that if I time the punch back into full throttle wrong. I am not seeing the 6 inch version of the Cyclone's yet but Emax has some Avan's out now you should try a set for a while and compare the difference. I really think you will be surprised at the difference. Specially since you are a tuner guy and not run stock pids with a bajillion filters pilot.